Paula Nusslein, a certified home chef, demonstrates the correct technique for rolling out pie dough during a holiday baking class at the Darien Community Association. Ovens hit overdrive in the holiday season as people prepare culinary favorites for family and friends during the holiday season, some more successfully than others. 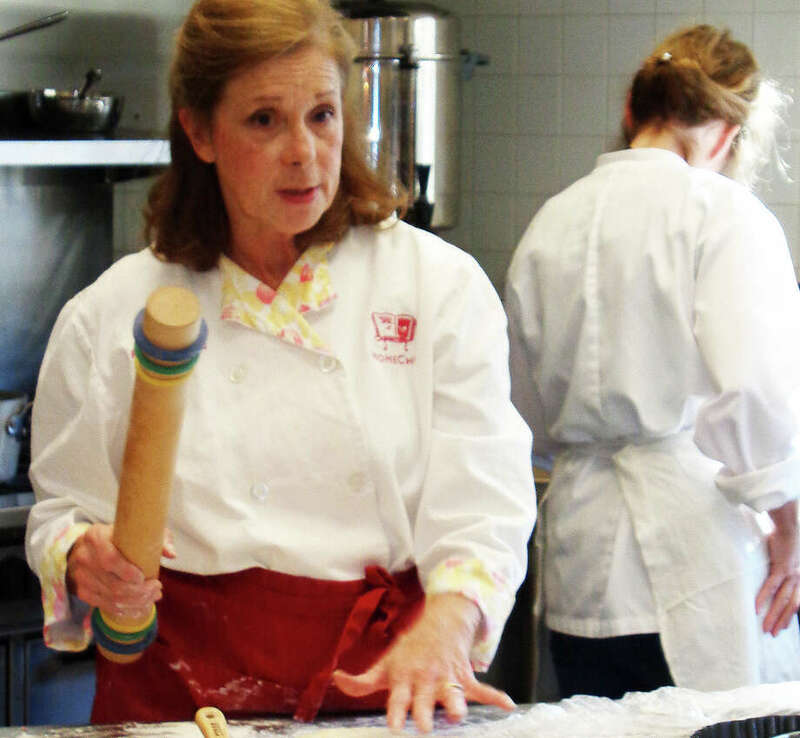 Paula Nusslein, a certified home chef, armed several amateur bakers with a wealth of tips and techniques last week during a class titled "Baking I: Sweet & Savory Pastry for Pies, Tarts and Quiches" at the Darien Community Association. She was assisted by baker and caterer Carolyn Eddie. "Our classes are technique-based. We talk about kitchen science," Nusslein said. Baking is a science that requires specific ingredients, tools, techniques and precise measuring, all of which the two women tackled in the two-hour class that ran about a half hour longer than scheduled. No one complained. The students' brains and taste buds got a workout. The class was heavy on knowledge, but in an interesting and delicious way. Students got to sample the sweet and savory pastry dishes that Nusslein and Eddie prepared including a fresh fruit tart with bananas, blueberries and pastry cream; a Granny Smith apple tarte tatin, Scandinavian meat turnover and Quiche Lorraine. Among the seven women who attended last week's class were Sally Steinthal and Valerie Cohen, both of Darien, and both of whom have taken several of Nusslein's classes previously. "There's so much technique she teaches: what tools will help you and what tools you don't really need," Steinthal said. "A lot of practical information," Cohen added. Heather Pommernelle, communications manager for the Darien Community Association, said Nusslein teaches culinary classes there on average once a month. Pommernelle said Nusslein's classes have a great progression. "The over-arching theme is you don't need a cookbook," she said. Nusslein and Eddie discussed the shelf-life and correct storage of flour. They provided recipes for basic short pastry, cream pastry and American pie dough. They demonstrated the proper way to roll out pastry, pre-bake pie and tart shells, make an egg wash and decorate with pastry. And they offered some time-saving tips like using an egg slicer to uniformly cut bananas, strawberries and other fruit for tarts and using muffin tins to create individual serving sizes of quiche. A lesson in perseverance was also on the menu. Eddie made four batches of caramel sauce for a tarte tatin before succeeding on the fifth attempt. The delicate confectionery liquid of melted sugar can be temperamental and can go wrong very quickly. "Don't take your eyes off it (on the stove). The sugar can crystalize," Eddie said. Keeping the holidays in mind, Nusslein and Eddie also talked about recipes that can be prepared a day or so in advance to ease the stress of cooking "mass quantities of food," and recipes for leftovers. Substitute ground beef or pork with turkey to make meat turnovers, they said. Nusslein will teach a related class, Baking II: Cakes, Puddings and Pies, with assistance from Eddy on Tuesday, Dec. 9, from 9:30 to 11:30 a.m., at Darien Community Association. The women will offer techniques behind the science of baking while making holiday favorites like a classic rum Bundt cake "with a recipe that's about 100 years old," Nusslein said, warm chocolate brownie cups -- "a chocolate lover's dessert," Eddie said -- as well as Eddie's famous British sticky toffee pudding. "It's about warming up the kitchen and making it smell lovely this time of year," Pommernelle said. To register call the DCA at 203-655-9050 or visit the website, www.dariendca.org.